This is crop of the M8/M20 project. The total data set is 22 lights - a 90% stack gives 19 lights. All were done at Montebello over three nights: July 23, 29, and 30th. The crop was made as a custom rectangle in DSS and a 2x drizzle stack. In processing in PI, I was happy with how it looked, but on importing to LR, the blue and red were garish so they were toned down a bit. There were some general issues along the way. After the first session, I went up again on the 26th, but the weather didn't cooperate. This was fine, because I learned that the shutter and mirror had let go because of the heat in the car. The low-temperature hot melt glue had lost the ability to hold the small parts in place. Thus, I had to fix the problem. I went with small drops of cyanoacrylate adhesive. It's a permanent solution and that's fine with me. If anything, it reminds me that the choice to make changes to the camera to ONLY run as an astro camera is OK.
On the evening of the 29th, I found that something was amiss with the USB cable. The tethering software wouldn't see the DSLR and the SSAG wasn't connecting. Very strange! So, I checked the USB repeater cable and found that it was dead! Luckily, I brought the old USB hub I had sitting around. That worked OK - although it didn't like being powered by 5V. This might be the reason why the serial cable stopped working properly. I've ordered replacement parts. On the evening of the 30th, I wanted to secure this replacement hub as the cable joint is weak. I used a bungee ball and unfortunately, that got jammed by the DEC motor. Only after several attempts to unbind the DEC axis gear did I realize the true problem. Major disaster averted, lost about 1 hour under the stars. Also on this evening, I noticed after finishing the M8/M20 target - and near the end of the night - that the cooler wasn't running. Had to wiggle the connection with the powerpole to get it running again. Later in the morning, I inspected that connector and saw that the metal contact wasn't properly seated. This was likely the source of the problem that I'd noticed for some time. Now it's fixed and all is good again. During these nights I was running the dual setup, just like at GSSP. The GM8 was plugging away with the Pentax 67 camera on it. I put the IDAS LPS filter on the 200mm lens and let it capture several parts of the sky, repeating some of the targets missed at GSSP. 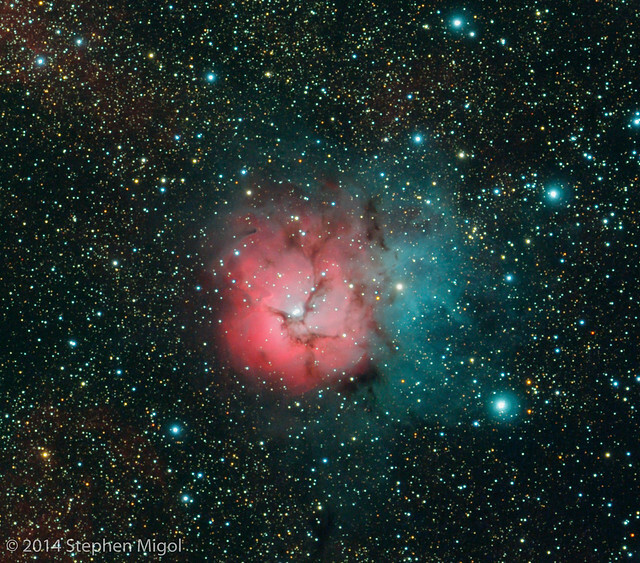 Since the mosaic worked so well in PixInsight, I thought it would be a good thing to continue. I'll be scanning and posting those images later.